A few weeks ago, Brandon from Elevation Boutiques contacted me letting me know of a new company called GOD BOX and wanted to get a pedal over here for a demo. Of course that’s always a great idea. Next thing you know the GOD BOX Tesla Fuzz arrived. First thing that struck me was the Wardenclyffe Tower (aka Tesla Tower) on the face. Very cool graphic and I have to admit, I’m a big Tesla fan. Okay, back to the pedal. 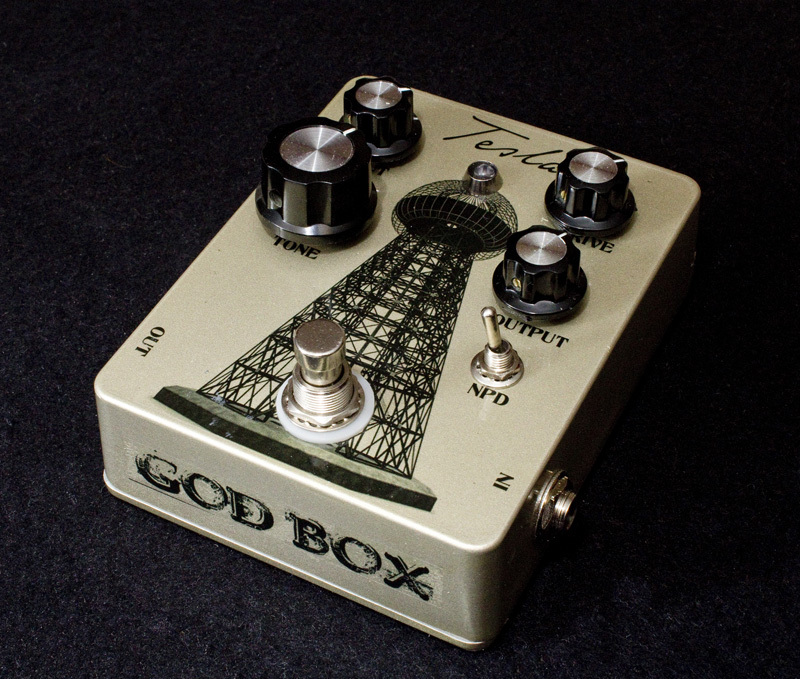 GOD BOX refers to this as the Tesla Edition God Complex Fuzz Series. I’m not sure if they’re planning to issue different versions of this pedal, I’ll let you know once I get more details. The GOD BOX Tesla Fuzz is a hybrid germanium and silicon circuit (inside there is a vintage NOS germanium transistor paired with a high quality silicon transistor). NPD – Toggle switch to control the NPD (Narcissistic Personality Disorder). This drops in distortion diodes which slightly compresses the signal. For this demo, I again asked my good friend Jimmy Rolle to see what the GOD BOX Tesla Fuzz was all about. This time, he’s not using his Les Paul and went with the Standard American Fender Stratocaster. Guitar is still going into a Germino Lead 55 through a Marshall 4×12 cabinet. Everything was mic’d up with a Shure SM57 and a Fathead Ribbon Mic. Nothing between the guitar and amp besides the GOD BOX Tesla Fuzz. We included a second video to focus on the NPD tonal changes. As you can see and hear, this is a great sounding fuzz with a lot of tonal variety. If you’re interested in picking up a GOD BOX Tesla Fuzz, you should contact Brandon at Elevation Boutiques (the exclusive dealer of GOD BOX) and he’ll hook you up (Looks like it’s available for $219). If you want to learn more about GOD BOX, please check out their Facebook page. Their website is currently being developed, but the GOD BOX Facebook page is a great way to see what they’re working on!